The same day of week she was born, we woke up today and went to early service at the extraordinary First United Methodist Church in Bakersfield, Ca. The sanctuary was full of people, the service was wonderful, and we were impressed by everything. After church we accepted their invitation to join members for the coffee and doughnuts fellowship. We greatly enjoyed visiting with the members and stayed almost two hours there, talking about life, travel, health, and community. We visited with Ann at Bakersfield Heart and she is doing okay. One of the most touching things we’ve seen since she entered the hospital happened at lunch. One of the nurses, Geri, asked if she could join Jerry, Deb, and me at our lunch table. We thought, at first, she wanted a place to sit. Instead, we learned, she wanted to talk to Jerry about his plans for repatriating Ann to Belmont, NC. She gave Jerry very good information about flying home with Ann, how to prepare for the flight, and best manage the flying time. And, Geri offered to drive Jerry and Ann on Geri’s day off the 120 miles to LAX airport. We were so impressed with her gracious selflessness. This has been a nice day. Today’s temperatures stayed under 95 and we’ve had a nice breeze all day. Deb opened her presents (all small things so she’ll find space for everything) and we looked at the paper. And her family called her to wish happy birthday. We’re looking forward to the cooler temperatures for a few days, this one has been a great relief. Happy Birthday, Debbie! Why chase 75F degree climates? I’ve talked about how hot Bakersfield can be but didn’t mention how our air conditioner deals with it. Today it’s over 104 outside and our camper’s air conditioning has been running full blast since 0830 hours. We’ve done our best to keep the door closed and kept all the shades and curtains pulled. The indoor temperature climbed after lunch to a maximum of 86F degrees, and stayed there until almost dark. Some campers have extra insulation and other provisions to allow all-weather use. We understand, from experience, our camper is not designed for weather temperature extremes. Chasing 75 degrees is a good premise for us. We’re glad the forecast for Sunday, Monday, and Tuesday is for cooler nights and less hot days. We’ve spent time in places more than twenty degrees cooler than 75 and experienced no difficulty maintaining the camper at 75 inside. But we have only one air conditioner. Our camper is factory-equipped with electric strip-heat in the roof unit and a gas-fired furnace ducted throughout the camper. To these we added a ceramic “cube” heater and a gas-fired catalytic heater. Who woulda thought we’d camp in over 100F degree temperatures? You can’t always chase after ideal conditions, and we can enjoy even this hot weather. We’ll chase 75 degrees another time. How long do you think it takes? Today we found the propane tank fill service, the better of the two nearby grocery stores, a SuperCuts and checked out their hours for the next few days, sized up which intersections have the best price competition for gas, found a beautiful branch library and city park, and found the church service most appealing for tomorrow morning. Yesterday we found, not without considerable trial and error, the Camping World and Verizon stores. The day before we found the nearby GM dealer and had our oil change service. What else could you need? So, in under a week in Bakersfield, we’ve found the hospital and our way around and the essential services. I’ve lived much longer in some cities without figuring this out. Yes, I was working and my context was completely different. I knew the schools, libraries, and work-related locations quickly. My mind was pretty fully occupied with family and work. When Deb and I hit a community we concentrate on our few external needs. We can gauge pretty well what we’ll need for the next week or two. You know how long you have. New in a community, you might take your time finding things. I did. I figured I had a lot of time, up to three or four years easily. We aren’t rushing things, but are able to focus differently than before. When we were backpacking we realized soon our priorities were pretty basic. Set up shelter, find water, prepare food and a fire. That’s about it. And these things took a lot of our time when backpacking. Nowadays if we are camping only a few days in a new location we might, or not, need groceries. If we are around a week or two we’ll have more time to catch up on shopping or other necessities. We don’t have very much time, either way, in most places we’ve visited. Find it on the way in or ask around when we arrive. People in the campgrounds are glad to share with us the sources they’ve found. This is efficient. And, of course, we have the benefit of the computer and the GPS to search out services and locations. We’re pretty comfortable with all this. How long does it take to find your way around a new place? Two answers: It depends, and, how long do you have? You probably take the time you have. I think I did. Without hurrying, I guess we’ve become more efficient at finding the certain things appealing or necessary to us. We’ve practiced, we’re deliberate, and we’ve learned. Our needs and wants seem pretty simple. Finding our way around in a new location may be totally different from anyone else finding way around the same area. Our house is only 200sf and uncomplicated by yards, garages, attics, bicycles, motorcycles, and cars. For us, finding the services and suppliers we need just seems to come naturally now. And we like it. we ordered resort beverages (adult, you know?). It was very pleasant to sit and sip and chat with one another, completely relaxed. We talked awhile about what drew us all to Bakersfield, the heart attack of our eighth member. While she is recovering in the seemingly very capable Bakersfield Heart Hospital, we are all quietly trying to deal with staying here. Our prime mission is to help plan for, and provide comfort to, Jerry while Ann is in the hospital. We’ve divided up doggy duty for their miniature schnauzer, Pepper. And we are watching Jerry like a hawk to be sure he is eating and taking care of himself. This all seems to be working well, in great part, due to the Bakersfield RV Resort. This is the nicest rv resort we’ve stayed in, anywhere. There may be some nicer ones but we haven’t seen them. The resort is owner-operated and you can see readily the owners are paying daily attention to everything. This is, for sure, the off-season but you’d never know it for the way the resort is taking care of operations and facilities. Everything is running and all services are available. We asked the bar last night their hours. They responded, as long as you want us to stay. This embodies the spirit of servitude we have sensed from the time we arrived. Very accommodating, friendly, and helpful. Today we found the laundry room and fitness room. At least a dozen very clean washers and as many dryers are in a spotless and air-conditioned laundry room. The fitness room sports a treadmill, weight machines, stretching balls, and exercise mats. 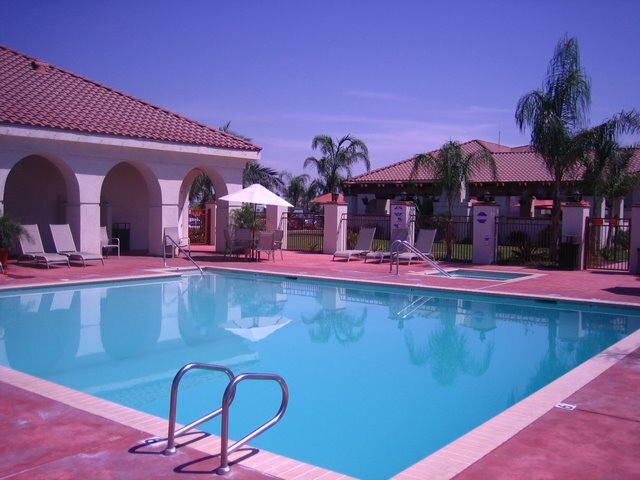 The swimming pool and whirlpool are in a very attractive fenced patio area and are treated with misting foggers to cool people, as in the lounge. We haven’t tried the restaurant but expect it will be as excellent as everything else. This family-owned rv resort seems to have thought of almost everything and executed it with class. The friendly management and staff at Bakersfield RV Resort are making our stay in this very hot Southern California climate very comfortable. They are helping us help Jerry, Ann, and Pepper. We appreciate it a lot. We hope we find other resorts as nice as this. And, we hope this resort does well. They sure seem to be trying hard in all the right ways. We’re in the desert, in Bakersfield, Ca. The morning newspaper’s weather data included the seasonal rainfall total — zero. Seasonal rainfall last year? Trace. The temperatures are 103 degrees daily this week. The big news, for us? A low temperature forecast for Saturday night of 70 degrees. Our air conditioner is holding its own, thankfully. Otherwise, we’d be really camping. We’re so spoiled by our fully-equipped rolling home. The RV Resort swimming pool closed yesterday for two days. Good grief. They offered us the hot tub, which I thought was really laughable since the daytime outdoor temperature has stayed close to 100. I don’t know, maybe the hot tub would make us feel cooler when we got out? Not very much, though, I don’t think. I much prefer a nice cool swimming pool instead. We’ll be in line Friday morning to enjoy the pool when it opens. Our truck had its oil and filter change today at the dealership in Bakersfield. I was leary of having mechanical procedures done on our truck away from home. But since home is on the road now, I’ll have to adapt. This is our second time on the road to have the truck’s oil and filter changed, and I’m getting used to it. The Chevy dealership here, like the one in Bozeman, Mt, runs a quick-lube shop in the dealership. We’re again pleased with the service we received and impressed with how they organize and run their service. The truck is good for 3,000 to 5,000 miles before another service. How hot is it in Bakersfield? We asked the food and beverage manager tonight if the high temperatures we’ve experienced these past few days are normal. He said for daytimes 100 degrees is completely within the normal range through August, and after 18 years he still isn’t really accustomed to it. He’s glad to be working indoors. The Annual Kern County Fair is coming up soon, and he said every year they seem to have at least one day hitting at 100 degrees. Yeah, but remember. This is dry heat so it’s not the same. Right? Tell that to my sewer hose! We were away from the camper six hours during midday today. 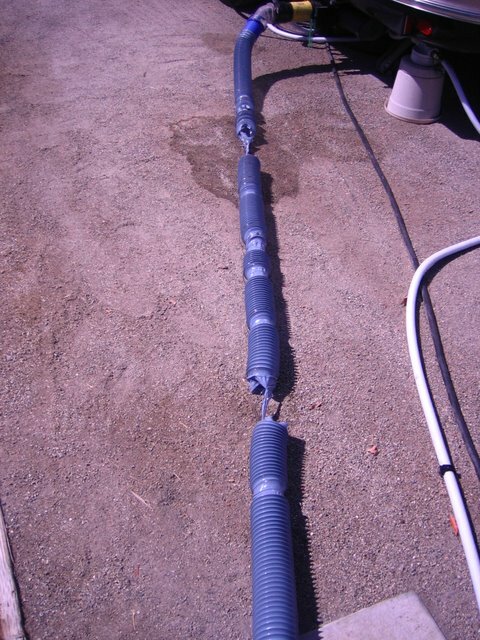 When we returned, we found our sewer hose had disintegrated completely. Just shredded itself. Ironically, the packaging on the box for this ten feet long section of hose says, “Good for extreme weather”. There may be hotter places, but we don’t think we want to stay many days there. We were headed, slowly, for Vancouver, BC. We had driven from Arcata to Bandon, OR, and yesterday we enjoyed a two hour walk on the beach, then a stroll about old Bandon. Then yesterday afternoon we learned a good friend had suffered a severe heart attack in Bakersfield, CA on her way from our caravan back to NC. So we last night hitched up the camper to the truck and went to bed early so we could start driving to Bakersfield by 0500 hours today. It worked. We’re in Bakersfield, CA after a record-setting drive of 765 miles in just under 15 hours. Our moving average was 55.5 mph, our overall average was 51 mph, our stopped time was only 51 minutes for the entire day. We stopped to refuel twice, once in Oregon for $3.95 a gallon and once in California for $3.73 a gallon. We averaged 11.7 mpg, drove approx 60 mph, and snacked in the truck instead of stopping for food. We planned to arrive before 8pm in the campground, and arrived at 7:35 p.m. The drive was pretty neat. When’s the last time you drove by miles and miles of olive trees? Or thousands of acres of vineyards, grapes perfectly ripe for picking? Did you know they claim to be the raisin capital of the world? And have you seen beautiful groves of English walnut trees, or almond trees, or pistachio trees? I didn’t even think pistachios grew on trees and today (at 200 yards and 60 mph) I saw them. Who knew? Otherwise the day was eye-burning driving, Deb and me alternating two hours driving each. The passenger closed their eyes as much as they could to rest up for their stint at driving. We didn’t get a single picture all day, just stayed in the truck and drove drove drove. It’s sorta funny, only two days ago we renewed our pledge to drive 200 miles, get off the road by 2:00 p.m., and stay at least two nights. Then what do we do? Well, flexibility is not only nice, it is necessary. And if we didn’t have a camper we’d have to rent a motel room to be here. We’ll stay as long as we can help Jerry and Ann. We don’t need to plan this, we’ll just figure it out as we go. Then we’ll probably go to Vancouver, BC to provide Eleanor her big girl furniture we’ve been toting around in the back of our truck since June 5.
throughout almost the entire drive, and we stopped once before leaving California to run to the beach and dip our toes. Okay, we planned to dip our toes. Before we knew it and quick wave ran up to greet us and soaked us above our knees. Jim wore shorts and was barefoot, but Deb was wearing khakis and a pair of Crocs. One of her shoes went off in the surf and she chased it down yelling and laughing. The water was very cool and the air was not much warmer, around 60F degrees. 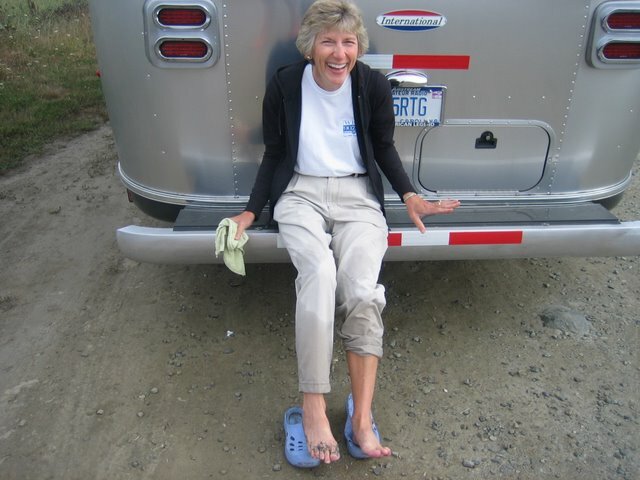 We sat on the camper’s back bumper and dried our feet and shoes before returning to the truck and driving into Oregon. The truck wanted some gasoline, we wanted a rest break, and in Brookings, OR we found an optimal place for both. Fred Meyers in Broookings provided us a nice shopping break for Sunday paper, a small inverter, some plastic dishes, safety flares, and a few small grocery items. The inverter will allow us to charge and use the laptop, as well as other 110 volt electronic items, from our 12volt supply. The flares satisfy the minimum towing safety requirements of some states, according to our Rand McNally Atlas. We’re restocked and good for a few hundred more miles, at least. We arrived early afternoon in Bullard Beach State Park, enjoyed a wonderful home-cooked meal in our camper, and watched Jack Nicholson and Diane Keaton in Something’s Got To Give. What a romantic movie! Rain started outside during the movie and continued through bedtime. So cozy!